We describe a Flippase-induced intersectional Gal80/Gal4 repression (FINGR) method, allowing tissue-specific FLP to determine Gal80 expression patterns. Wherever Gal4 and FLP overlap, Gal4 expression is turned on (Gal80 flipped out) or off (Gal80 flipped in). The FINGR method is versatile for clonal analysis and neural circuit mapping. Fore, T. R., Ojwang, A. A., Warner, M. L., Peng, X., Bohm, R. A., Welch, W. P., Goodnight, L. K., Bao, H., Zhang, B. Mapping and Application of Enhancer-trap Flippase Expression in Larval and Adult Drosophila CNS. J. Vis. Exp. (52), e2649, doi:10.3791/2649 (2011). The Gal4/ UAS binary method is powerful for gene and neural circuitry manipulation in Drosophila. For most neurobiological studies, however, Gal4 expression is rarely tissue-specific enough to allow for precise correlation of the circuit with behavioral readouts. To overcome this major hurdle, we recently developed the FINGR method to achieve a more restrictive Gal4 expression in the tissue of interest. The FINGR method has three components: 1) the traditional Gal4/UAS system; 2) a set of FLP/FRT-mediated Gal80 converting tools; and 3) enhancer-trap FLP (ET-FLP). Gal4 is used to define the primary neural circuitry of interest. Paring the Gal4 with a UAS-effector, such as UAS-MJD78Q or UAS-Shits, regulates the neuronal activity, which is in turn manifested by alterations in the fly behavior. With an additional UAS-reporter such as UAS-GFP, the neural circuit involved in the specific behavior can be simultaneously mapped for morphological analysis. For Gal4 lines with broad expression, Gal4 expression can be restricted by using two complementary Gal80-converting tools: tubP>Gal80> ('flip out') and tubP>stop>Gal80 ('flip in'). Finally, investigators can turn Gal80 on or off, respectively, with the help of tissue-specific ET-FLP. In the flip-in mode, Gal80 will repress Gal4 expression wherever Gal4 and ET-FLP intersect. In the flip-out mode, Gal80 will relieve Gal4 repression in cells in which Gal4 and FLP overlap. Both approaches enable the restriction of the number of cells in the Gal4-defined circuitry, but in an inverse pattern. The FINGR method is compatible with the vast collection of Gal4 lines in the fly community and highly versatile for traditional clonal analysis and for neural circuit mapping. In this protocol, we demonstrate the mapping of FLP expression patterns in select ET-FLPx2 lines and the effectiveness of the FINGR method in photoreceptor cells. The principle of the FINGR method should also be applicable to other genetic model organisms in which Gal4/UAS, Gal80, and FLP/FRT are used. GMR-Gal4, which expresses Gal4 in photoreceptor cells. UAS-MJD78Q (or UAS-polyQ), which causes neural degeneration in Gal4-expressing cells. UAS-GFP, which expresses GFP in Gal4-expressing cells. ey-FLP, which expresses FLP in photoreceptors and in subsets of brain regions. ET-FLPx2 lines, which are enhancer-trap lines containing two copies of FLP (FLP-IRES-FLP). We have generated ˜ 1,000 ET-FLP lines (Bohm et al., 2010), whose expression patterns are yet to be characterized. 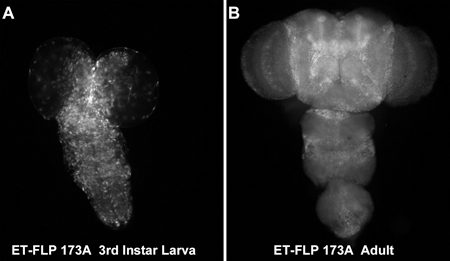 Here, we describe the characterization of the expression pattern of select ET-FLPx2 in the larval and adult fly central nervous system (CNS). yw, actinP>CD2>Gal4; UAS-GFP (Pignoni & Zipursky, 1997), which reports the expression pattern of ET-FLPx2 through actinP>Gal4; UAS-GFP upon FLP-mediated recombinational excision of >CD2. TubP>Gal80> (Gordon & Scott, 2009), the flip-out construct, which constitutively expresses Gal80 in all tissues driven by a strong tubulin promoter. Upon FLP-mediated recombination, >Gal80 is flipped out and Gal80 expression is terminated only in ET-FLPx2-expressing tissues. TubP>stop>Gal80 (Bohm et al., 2010), the flip-in construct, which does not express Gal80 under normal conditions. Gal80 expression is turned on by the tubulin promoter only in ET-FLPx2-expressing tissues in which FLP flips out >stop and flips in Gal80. GMR-Gal4, UAS-polyQ; tubP>stop>Gal80 (Bohm et al., 2010), which has degenerate and depigmented eyes. In FLP-expressing photoreceptor cells, polyQ expression is turned off following Gal80 flip-in. GMR-Gal4, UAS-polyQ; tubP>Gal80> (Bohm et al., 2010), which has normal eyes. In FLP-expressing photoreceptor cells, polyQ expression is turned on following Gal80 flip-out. Phosphate-buffered saline (PBS, 1X), pH 7.4. Anti-Elav (mAb, 9F8A9; Developmental Studies Hybridoma Bank, University of Iowa), stains all neurons in Drosophila. Anti-Repo (mAb 8D12; Developmental Studies Hybridoma Bank, University of Iowa) stains glial cells in Drosophila. Collect virgins females from the yw, actinP>CD2>Gal4; UAS-GFP line and cross to males of individual ET-FLPx2 lines. 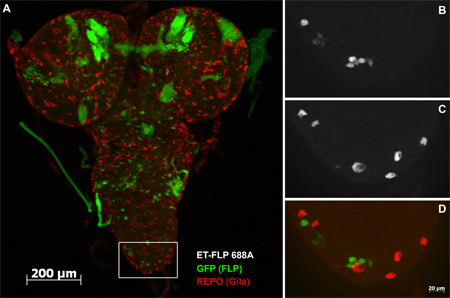 The former serves as a GFP reporter for tissue expression of ET-FLP. *Dissect wandering 3rd instar F1 larvae, retain the CNS (i.e., the brain and the ventral nerve cord, VNC) and the body wall, fix for 1 hour in 4% PFA on ice, wash 3X with ice-cold PBS followed by 3X washes with PBT. Remove wandering 3rd instar F1 larvae and place them into a clean Sylgard dish (35 mm x 10 mm petri dish filled with 2 grams of Sylgard - mixed according to manufacture instructions). Hold the mouth hooks of a larva with a pair of forceps and grab the cuticle near the extending anterior spiracle with another pair of forceps and peel the cuticle towards the posterior end. The CNS will be attached to the mouth hooks along with the salivary glands, gut, and imaginal discs. Remove the excess tissue and imaginal discs surrounding the CNS. Transfer the CNS into a PBS-filled 3 well pyrex dish. A siliconized P200 pipette tip can be used to avoid drying the tissue. Fix for 1 hour in 200 μl of 4% PFA on ice. Ensure that the CNS is fully submerged in the PFA. If the CNS floats, this typically suggests that the CNS is not properly cleaned from the surrounding tissue. Wash 3X with ice-cold PBS followed by 3X washes with PBT. *Dissect the CNS of adult F1 flies. Anesthetize the flies with CO2 or place the flies contained inside an empty vial on ice for 10 minutes. Place adult flies into a 95% EtOH-filled glass dish on ice for 30 sec. Transfer the adult flies into a 1XPBS filled glass dish on ice. Place the ventral side facing up and insert a small insect pen (minutiens pins 0.1 mm) midway through the abdomen. Using a pair of forceps hold the base of the legs and remove the legs with another pair of forceps. While grabbing the proboscis with one pair of forceps, place another underneath the eye and peel the cuticle towards the dorsal mid-line of the fly head. Grab the other eye and remove the remaining cuticle on the other side. Starting at the posterior end of the thorax, place two forceps on each side of the 3rd preepisternum (i.e., grabbing the base of the hind legs). Gently separate the cuticle away from the ventral midline line, repeat this until you reach the base of the neck. Next remove the abdomen from the thorax. While using a pair of forceps to hold the thorax at the second leg base, use another pair of forceps to grab the abdomen near the 1st abdominal sternite and pull the abdomen off. To remove the VNC from the surrounding thoracic tissue. Hold the humeral area with a pair of forceps and with another pair of forceps gentle tear away the majority of the thoracic carcass. At this point there should be a ring of connective tissue surrounding the cervical connective (neck). Using two forceps tear the ring apart. *Fix the adult CNS for 1 hour in 4% PFA on ice and wash 3X with ice-cold PBS and 3X with PBT. Incubate the adult CNS preparation or the larval CNS and body wall at 4°C overnight with antibodies to either neurons (anti-Elav, 1:10) or glia (anti-Repo. 1:10). Wash the preparation 5X with PBT. Incubate with adult or larval preparation with Alexa 594 chicken against mouse secondary antibody (1:100) at room temperatures for 2 hrs, and wash the preparation with PBS. Mount the larval or adult CNS on a slide. To preserve the natural shape of the CNS, use an O-shaped plastic ring (Clear Reinforcement Label, Avery Dennison, Office Products, Brea, CA) on the slide as a mini-bridge to suspend the cover slip. Examine the preparation for GFP and Elav (or Repo) expression patterns under a fluorescent microscope. Flipping Gal80 out via tubP>Gal80> (Figure 5A). Collect males from the GMR-Gal4, UAS-polyQ; tubP>Gal80> line. Note that the compound eyes are normal in these flies. Collect the F1 flies and examine the eye phenotype. Flipping Gal80 in via tubP>stop>Gal80 (Figure 5B). Steps 4.1 and 4.2 can be repeated using ET-FLPx2 lines that express FLP in a subset of photoreceptor cells. Alternatively, either the GMR-Gal4, UAS-polyQ; tubP>stop>Gal80 flies or the GMR-Gal4, UAS-polyQ; tubP>Gal80> flies can be crossed to individual ET-FLPx2 lines to screen for lines that express FLP in photoreceptor cells. Valuable ET-FLPx2 lines are those that only express FLP in a subset or single photoreceptor cells (Figure 6). The expression pattern of a specific ET-FLPx2 line can be readily examined and documented in the F1 larvae or adult flies derived from the cross between yw, actinP>CD2>Gal4; UAS-GFP virgins and ET-FLPx2 males (Figure 1). Typically, three to five replicates of the F1 animals are dissected and examined to determine the reproducibility of the FLP expression pattern (Bohm et al., 2010). Figure 2 shows the expression pattern of FLP in ET-FLPx2 line 173A in the larval and adult CNS. The FLP pattern can be further analyzed using a neuronal or glial marker (Figure 3 & 4). 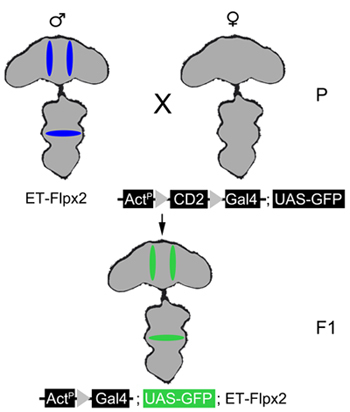 The results shown in Figure 7 illustrate the effectiveness of Gal80 flip-in and flip-out systems in intersectional repression of Gal4 following FLP-mediated recombination. The tubP>stop>Gal80 construct does not appear to have any leaky expression of Gal80 (based on the uniform degeneration and depigmentation of photoreceptors), and yet it is 100% effective in flipping Gal80 in with the help of eyFLP to repress GMR-Gal4 and restore the eye to normal appearances (Fig. 7A). On the contrary, tubP>Gal80> fully represses GMR-Gal4 prior to the introduction of eyFLP. Following Gal80 flip-out, GMR-Gal4 drives UAS-polyQ expression, leading to degenerate and depigmented eyes (Fig. 7B). In this example, we used a pan-photorecetor FLP to map the photoreceptor 'circuits' but did not examine the behavioral consequences. Using similar approaches with behaviorally relevant Gal4 lines, we mapped part of the CCAP-Gal4 circuit regulating wing expansion in adult flies (Bohm et al., 2010). We believe that the FINGR method will be valuable in aiding our understanding of the neuronal basis of behavior. Figure 1. Examining the expression pattern of an ET-FLPx2 line. The FLP expression pattern (blue ovals) from an ET-FLPx2 line can be determined by crossing an ET-FLPx2 male (top left) with an actinP>CD2>Gal4; UAS-GFP virgin (top right). Ubiquitous ActinP>Gal4 expression in the parental female is hindered by the insertion of the FRT (grey triangles) flanked CD2 sequence. In the F1 progeny, FLP will excise the CD2 sequence, permitting ActinP>Gal4 to drive UAS-GFP expression. Figure 2. Expression pattern of an ET-FLPx2 line in the larval and adult central nervous system. These images depict the CNS (brain and ventral nerve cord, VNC) dissected from the offspring produced from mating yw, actinP>CD2>Gal4; UAS-GFP parents to the ET-FLPx2 173A line. By recombining out the >CD2> cassette, FLP activates actinP>GAL4 expression (the consequent expression of UAS-GFP). Hence, the GFP pattern reports FLP-expressing cells. Panel A shows the larval FLP expression pattern whereas panel B shows the adult expression pattern in line 173A. Figure 3. Characterization of cell types which express flippase in ET-FLPx2 Line #688A. A, A composite image of a fixed F1 3rd instar larva stained with anti-REPO from a cross between ET-FLPx2 line #688A and a GFP Flippase reporting line. B-D, A high magnification (Zeiss Plan-Apochromat 63x oil) view taken from the posterior end of a VNC from a 3rd instar larvae. Figure 4. Characterization of cell types within the mushroom body of ET-FLPx2 Line #150. A-C, A high-magnification image (63x oil immersion) of the mushroom body from a fixed F1 3rd instar larva stained with anti-REPO. Figure 5. Illustration of Gal80 Flip-in and Flip-out Strategies. A. In the flip-out strategy, tubulin promoter-driven Gal80 (TubP>Gal80>) is constitutively active, resulting in the repression of GMR-Gal4 and a wild-type eye phenotype (red eye). This repression is removed by the introduction of FLP (purple), which will flip Gal80 out (middle, red) and allow GMR-Gal4 to drive UAS-polyQ expression. This results in photoreceptor cell degeneration (illustrated by white dots in the eye). B. In the reciprocal of the previous strategy, tubulin promoter-driven Gal80 expression is interrupted by FRT (grey triangle) flanked "stop" codon. In the absence of Gal80, GMR-Gal4 binds to UAS-polyQ causing neuronal degeneration in photoreceptors (illustrated by white dots in the eye). By crossing the GMR-Gal4, UAS-polyQ; tubP>stop>GAL80 males with virgin females which express FLP in the photoreceptor cells, FLP (purple) will catalyze recombination at the FRT sites, excising the "stop" codon (middle, red), thus allowing for Gal80 expression and repression of GMR-Gal4. This reserves the neurodegeneration in photoreceptor cells (illustrated by the lack of white dots in the eye). Figure 6. The application of the FINGR method in flipping Gal80 out using ET-FLPx2 Line #688A. F1 progeny from a cross between ET-FLPx2 line #688A virgin to GMR-Gal4, UAS-polyQ; tubP>GAL80 male. The lack of pigment in the middle of the eye ommatidia represents FLP expression in line #688A. In this area Gal80 suppression of GMR-Gal4 was relieved allowing the Gal4 to drive UAS-polyQ. Figure 7. The application of the FINGR method in flipping Gal80 in or out to intersect Gal4 in photoreceptors. A. The tubP>stop>Gal80 flip-in system restricts GAL4 expression in an FLP-dependent manner. In GMR-Gal4, UAS-polyQ; tubP>stop>GAL80 flies, photoreceptor cells are degenerate and depigmented (left fly). Following the introduction of eyFLP, Gal80 is expressed in photoreceptor cells, resulting in full repression of GMR-Gal4, which in turn turns off the expression polyQ and produces flies with normal eyes (right fly). B. The tubP>Gal80> flip-out system works in the opposite fashion as the tubP>stop>Gal80 flip-in system. TubP>Gal80> constitutively represses GAL4 and suppresses the expression of polyQ (left fly, with normal eyes). Following the introduction of eyFLP, Gal80 is flipped out from photoreceptor cells, relieving the suppression of GMR-Gal4 and turning on the expression polyQ. This leads to flies with degenerate and depigmented eyes (right fly). The Gal4/UAS system has been widely and successfully used by Drosophilists for various biological studies (Brand & Perrimon, 1993; Duffy, 2002). To date, the fly community has generated thousands of promoter-driven and enhancer-trap Gal4 lines. A major strength of the FINGR method is that it is compatible with the Gal4/UAS system, making it possible to significantly expand the power of Gal4 in Drosophila studies. One important application of the FINGR method is to fine tune neural circuits underlying behavior through Gal4/Gal80 intersection. These behaviors may include, but are not limited to, learning and memory, courtship, sleep, and circadian rhythm. The FINGR method can also be used to map the critical neurons that are prone to neurodegeneration in modeling human neurodegenerative diseases such as Alzheimer's, amyotrophic lateral sclerosis (ALS), and Parkinson's diseases. Similarly, foci of neurons or neural circuits crucial for mediating cocaine, alcohol, and other substance addiction might be mapped using the FINGR method. It should be noted that conditional Gal4s (Osterwalder et al., 2001; Roman et al., 2001) could be used with the FINGR method in order to gain temporal control of neural circuits and behaviors. Modification of the Gal80-converting tools by using a temperature-sensitive Gal80 (Gal80ts, McGuire et al., 2003) can produce tubP>stop>Gal80ts or tubP>Gal80ts>, adding further temporal flexibilities in circuit manipulation. Beyond the nervous system, the FINGR method is equally applicable to restricting Gal4 expression in subsets of cells whether it is the wing or the leg. The ET-FLPx2 lines will be a valuable resource for all Drosophila biologists interested in FRT/FLP-based clonal analysis (Xu & Rubin, 1993), including MARCM (Lee & Luo, 1999). It is also expected that some ET-FLPx2 lines may replace heatshock-FLP for producing reproducible clones and for repeated morphological and behavioral analyses. Like enhancer-trap Gal4 lines, most ET-FLPx2 lines are unlikely to be expressed specifically in the cells of one's interest. Most lines will express FLP in the cells of interest AND in other cells or tissues as well. However, the lack of 'tissue specificity' of both Gal4 and ET-FLPx2 will not be a major concern for the FINGR method as long as their overlapping region is desirable for a particular experiment. FINGR is designed to turn two 'broad' systems into a refined one. The methods illustrated in these protocols are rather standard and should be reproducible. The major cautionary steps that require one's attention are the selection and usage of the fixative. Fixatives other than PFA should be avoided because they will quench GFP signal. We have also noted that the dissection dish should not be used for fixation with PFA to avoid the possibility that FLP expression will not be reliably reported by GFP. We thank an internal fund from the University of Oklahoma (to BZ) and a grant from NSF (IOS-1025556, to BZ and RAB) for supporting TRF, RAB, XP, AAO, MLW, CAS, and this research. An NIH grant (RO1 NS060878, to BZ) partially supported RAB. RAB acknowledges an NIH NRSA (T32 NS07292) training grant awarded to Brandeis University, and an NIH grant (RO1 GM21473) awarded to Jeffrey Hall at Brandeis, for supporting the early stages of this study. We thank Jeffrey Hall for his continuous encouragements for this project. We thank Dr. Kristin Scott for providing us with the tubP>Gal80> strain. Bohm, R. A., Welch, W. P., Goodnight, L. K., Cox, L. W., Henry, L. G., Gunter, T. C., Bao, H., Zhang, B. A genetic mosaic approach for neural circuit mapping in Drosophila. Proc Natl Acad Sci U S A. 107, 16378-16383 (2010). Brand, A. H., Perrimon, N. Targeted gene expression as a means of altering cell fates and generating dominant phenotypes. Development. 118, 401-415 (1993). Bruno, B., Holbro, N., Reichert, H. Polycomb group genes are required for neural stem cell survival in postembryonic neurogenesis of Drosophila. Development. 134, 1091-1099 (2007). Duffy, J. B. GAL4 system in Drosophila: a fly geneticist's Swiss army knife. Genesis. 34-341 (2002). Gordon, M. D., Scott, K. Motor control in a Drosophila taste circuit. Neuron. 61, 373-384 (2009). Lee, T., Luo, L. Mosaic analysis with a repressible cell marker for studies of gene function in neuronal morphogenesis. Neuron. 22, 451-461 (1999). McGuire, S. E., Le, P. T., Osborn, A. J., Matsumoto, K., Davis, R. L. Spatiotemporal rescue of memory dysfunction in Drosophila. Science. 302, 1765-1768 (2003). Osterwalder, T., Yoon, K. S., White, B. H., Keshishian, H. A conditional tissue specific transgene expression system using inducible GAL4. Proc Natl Acad Sci USA. 98, 12596-12601 (2001). Pignoni, F., Zipursky, S. L. Induction of Drosophila eye development by decapentaplegic. Development. 124, 271-278 (1997). Roman, G., Endo, K., Zong, L., Davis, R. L. P[Switch], a system for spatial and temporal control of gene expression in Drosophila melanogaster. Proc Natl Acad Sci U S A. 98, 12602-12607 (2001). Xu, T., Rubin, G. M. Analysis of genetic mosaics in developing and adult Drosophila tissues. Development. 117, 1223-1237 (1993).